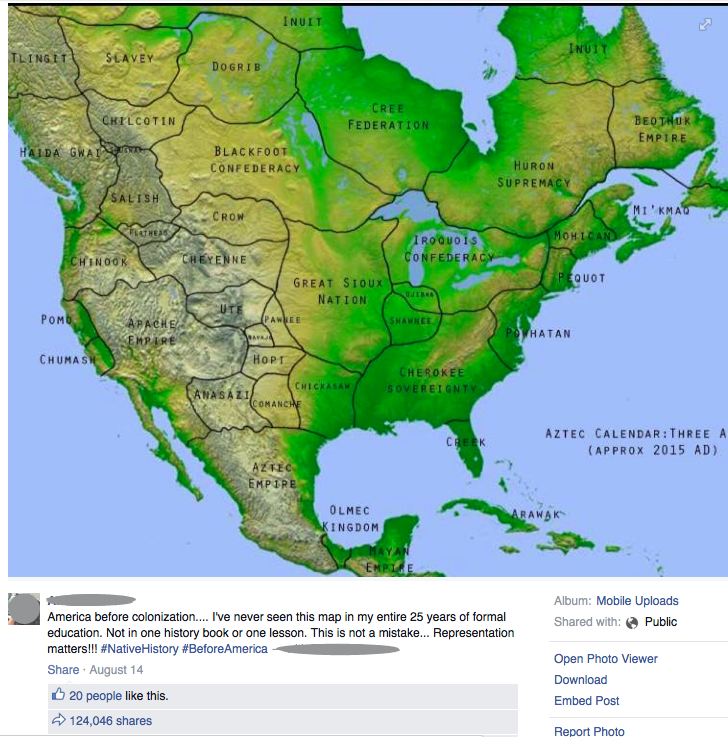 Yesterday, a cool-looking map showed up on my Facebook feed, shared by a friend; it depicts the North American continent with the historical political boundaries of the native Americans. It listed clear boundaries for separate states of the First Nations: Anasazi, Apache Empire, Arawak, Aztec Empire, Beothuk Empire, Cherokee Soverignty, Cheyenne, Chickasaw, Chilcotin, Chinook, Chumash, Comanche, Cree Federation, Creek, Crow, Dogrib, Flathead, Great Sioux Nation, Haida Gwai, Hopi, Huron Supremacy, Inuit, Iroquois Confederacy, Mayan Empire, Mi’kmaq, Mohican, Navajo, Ojibwa, Olmec Kingdom, Pawnee, Pequot, Pomo, Powhatan, Salish, Shuswap, Slavey, Tlingit, and Ute. I’d never before seen such a clear depiction of the geopolitical boundaries of pre-Columbian America, and it was a stark reminder of how we, as a people, systematically invaded and destroyed a continent of cultured peoples. We wiped away their cultures, their languages, their history, and even the memory of them, leaving only scraps behind, and we protect our current borders of land they used to live on. The American Indian Wars ended in 1924, less than a hundred years ago, but it’s not even part of the American political dialog. And we’ve whitewashed our pogroms against Native Americans, in the same way we’re presently sugar-coating slavery in history courses. Well said. And others agreed… the post has over 150,000 shares as I write this! But something smelled wrong to me about the map itself. Korzybski remarked that “the map is not the territory”, reminding us that we shouldn’t confuse our mental models for reality. But maps, and data visualizations of all kinds, are really powerful, conveying complex ideas easily, and even shaping (or misshaping) perceptions about facts. This is one reason why decentralization of mapping resources and services is good; no one organization should control our common maps. SVG is a natural fit for mapping. There’s even a detailed proposal by KDDI’s Satoru Takagi-sensei for tiling, layering, and coordinate resolution that fits on top of SVG, which I’d like to see standardized. I’ve had an idea for a small open-source project for a while, which I’ve discussed with the brilliant Andreas Neumann of Carto.net; he’s been too busy planning SVG Open every year to help out with it thus far, and I don’t have the skills to do it without a great investment in time.